March 29th, 2011 – Has TEPCO-NISA determined extent of damage to floors around spent fuel pool? 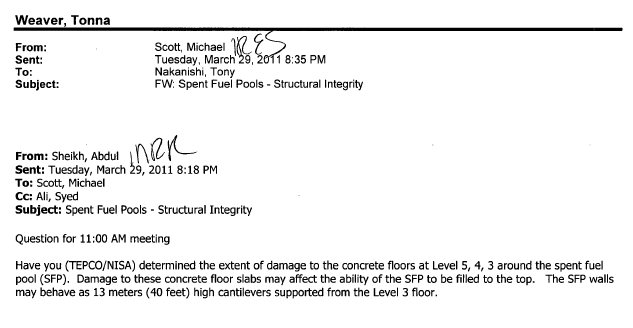 Have you (TEPCO/NISA) determined the extent of damage to the concrete floors at Level 5, 4, 3 around the spent fuel pool (SFP). Damage to these concrete floor slabs may affect the ability of the SFP to be filled to the top. The SFP walls may behave as 13 meters (40 feet) high cantilevers supported from the Level 3 floor.